A cheesesteak, also known as a Philadelphia cheesesteak, Philly cheesesteak, or steak and cheese, is a sandwich made from thinly sliced pieces of steak and melted cheese in a long roll. 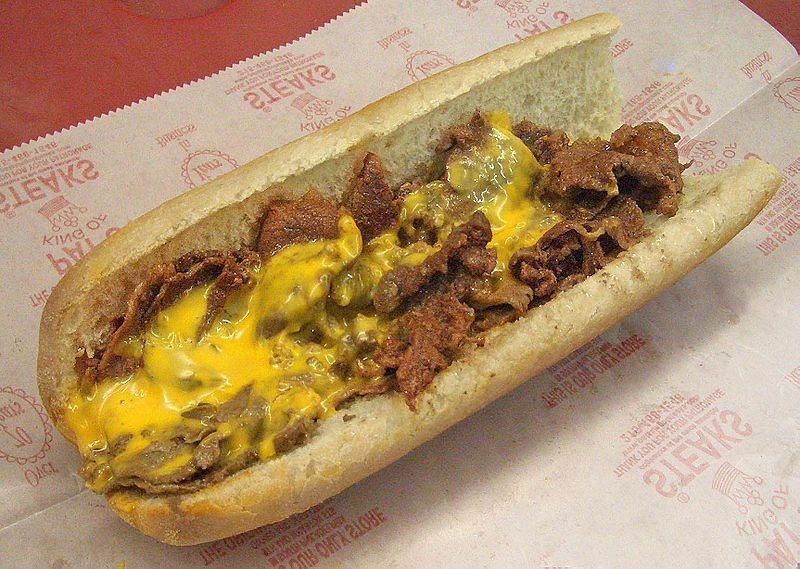 The cheesesteak is one of the favorite foods of the city of Philadelphia, Pennsylvania. Left: Cheesesteak with Cheez Whiz. The meat used is thinly sliced rib-eye or top round although other types are also used. The steak is placed on a lightly oiled griddle at medium temperature. The slices are quickly browned and then scrambled into smaller pieces with a flat spatula. Often, the steak is placed on top of already slightly fried onions to prevent the steak from becoming over-cooked. Thicker slices are also sometimes used. Some vendors omit the chopping, serving their sandwiches with these slices of steak in whole form. Cheesesteaks should have a creamy cheese taste that does not dominate the sandwich. White American cheese, Mozzarella, provolone, and Cheez Whiz are the most frequently used cheeses. American cheese is a favorite due to its mild flavor and medium consistency. Some places pre-melt the American cheese to achieve the creamy consistency, while others just put freshly cut slices over the meat, letting it slightly melt under the heat. Provolone is also popular. In Philadelphia most cheesesteak places use Amoroso or Vilotti-Pisanelli rolls.